Last weekend saw us return to River Cottage in Dorset with D and G – technically it’s in East Devon but most of our weekend was spent in Dorset. 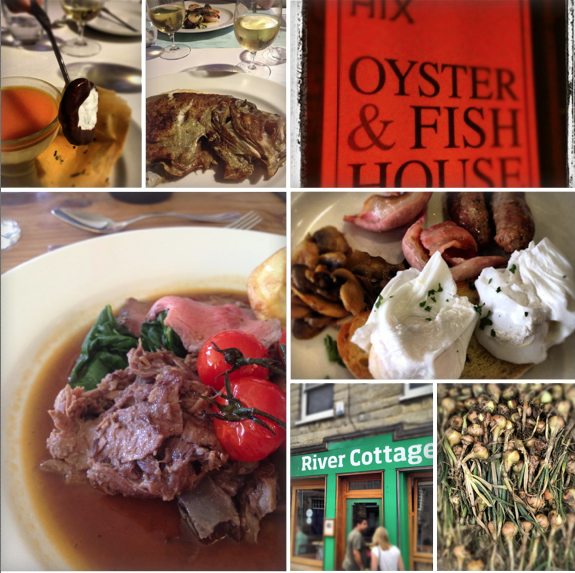 We’d bought G a special Sunday Lunch at the River Cottage HQ Voucher (on the proviso that we could come along too) and built a rather splendid weekend around that. Saturday night we ate at Mark Hix‘s wonderfully chilled out Oyster and Fish restaurant in Lyme Regis which enjoys panoramic views if the jurassic coast, although the murky sea fret meant the view from our table was somewhat less spectacular which was a shame. Although the food and service amply made up for that – it was top notch and definitely in Rick Stein territory in terms of experience, with prices to match I might add. Sunday was a beautifully sunny day (eventually) and our Sunday afternoon was sublime: mooching about the River Cottage HQ, inspecting the gardens and the cottage where they film the TV series and featuring one of the best Sunday lunches I’ve ever had. Beef three ways including ox heart canapés – well it wouldn’t be RC if there weren’t anything odd or unusual to try. All delicious of course. Breakfast the following day was taken at River Cottage canteen in Axminster which again was superb with great quality ingredients which raised the humble full English to memorable status. Hugh’s empire in Dorset is becoming comparable to Rick Stein’s in Cornwall and actually it’s all done very well – his personal brand shines through in all aspects. It’s also very evident that the local economy is boosted significantly by his presence and in a county where tourism is king, I suspect he gets every encouragement from the powers that be. One negative we found was the laughably expensive taxis – they seem to be making hay whilst the sun shines charging ludicrously high fares for what are very short distances. It was the only thing that left a sour taste, unlike the food which was of the highest standards.